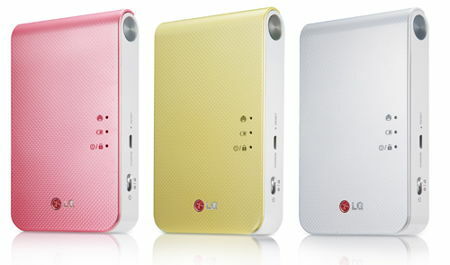 LG, the South Korean consumer electronics giant, has just announced that they will be showcasing their LG Pocket Photo 2.0 over at CES 2014 that is kicking off in less than a fortnight’s time. This will be the second iteration of their original Pocket Photo device, where it will offer enhanced portability thanks to its form factor, letting you customize, print and share images regardless of where you are. Just what kind of connectivity options will the latest LG Pocket Photo 2.0 come with? It features wireless connectivity such as NFC and Bluetooth, allowing you to instantly print 2” x 3” photos from majority of the tablets and smartphones that are in use today. Not only that, it will also play nice with Android and iOS devices, which should cover a fair bit of ground – although Windows Phone and BlackBerry owners would miss out on the Pocket Photo boat. Touted to be one of the smallest mobile photo printing devices on the market, this most recent version would have shaved off 4mm from its predecessor in terms of thickness, and yet it does not affect its performance at all. On the contrary, the LG Pocket Photo 2.0 would be able to print pictures rendered at a crystal clear 313dpi, which makes them perfect for sharing or displaying. You will first need to download and install the free Pocket Photo editing app though, so that you will be able to print right off the bat after connecting your smartphone or tablet to it sans wires. LG has also gone the extra mile to introduce enhancements to the editing features in the accompanying Pocket Photo app, paving the way for you to experiment with an expanded range of customization options. There is a new set of filter effects thrown into the mix as well, in addition to a clever frame augmentation feature. Not only that, you can also opt to embed QR codes in photos, making it a convenient method to connect a physical photograph with an online community or an Internet-based content. ZINK’s inkless paper system will deal with the photo printing process, and a single full charge of the LG Pocket Photo 2.0 delivers up to 30 photo prints.